New York City attractions for families are as diverse as the city itself. History buffs will enjoy such places as the Empire State Building and the Statue of Liberty, while the musicians in the family will enjoy learning more about the venue at Madison Square Garden and the Hard Rock Café. Whether it is history, music, or culture, there is much to learn and to enjoy in the Big Apple. An absolute must see in New York City, the Empire State Building provides visitors with the most spectacular views of the city below. The "view from the top" provides an awesome and exhilarating panoramic view of skyscrapers and landmarks. Upon entering the magnificent building, visitors are greeted by a welcoming staff. Staff is more than willing to answer questions in order to make sure families take advantage of all the thrilling activities offered at the Empire State Building. If there were only one landmark to visit on a trip to New York City, the Statue of Liberty is that destination. As a symbol of liberty and freedom, children will benefit greatly from the history lesson provided by this attraction. Guided tours with a new video system make it easy for visitors to learn the history of both Liberty Island and the Statue of Liberty. Booklets are available for seven through twelve year old children that explain the history of this American icon in age appropriate text, helping to make learning fun. If it's lunch or dinnertime, one of the best ways to incorporate a taste of New York City is with a meal at the Hard Rock Café. Located in the heart of Times Square, the Hard Rock Café offers a bit of music history to all genres and eras of music. From The Beatles to James Brown to Madonna, the history of music and the musicians who have made their mark are all spotlighted here. Enjoy a mouthwatering jumbo burger or nimble on Joe Perry's "Rock Your World" Quesadilla. On a trip to New York City, it is hard to miss Madison Square Garden, known as the "world's most famous arena." Not only is the Garden a sight to see, the venues range from sports to concerts to activities for children. Watch the New York Knicks slam dunk a victory or enjoy a "friendly" hockey game, jam packed with excitement provided by the New York Rangers hockey club. The Intrepid Sea Air Space Museum is one of the most exciting New York City attractions for families. This fascinating museum makes it possible for visitors to experience life on the sea, in the air, and out in space. With activities and tours that are kid friendly and packed with information, it is sure to be a treat for everyone interested in learning more about the universe. Simulators and exhibits detail every square inch of submarines, aircraft carriers, vintage prop-planes and more. Children can actually pilot many of these expeditions, making for an unforgettable experience. 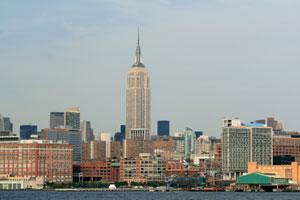 The New York City Circle-line Sightseeing Cruise is a water tour of mid and lower Manhattans. This adventure makes it possible for guests to see New York from outside the city limits. Tour guides will assist in answering questions while detailing the history of the city. For first timers to the city, this is an easy way to get to know the layout. Food and Beverages are available during the 2-hour cruise, so instead of sitting in traffic going from landmark to landmark, take a relaxing trip by sea.